Earnings HQ: FBN’s Ashley Webster breaks down Merck’s first-quarter earnings report. 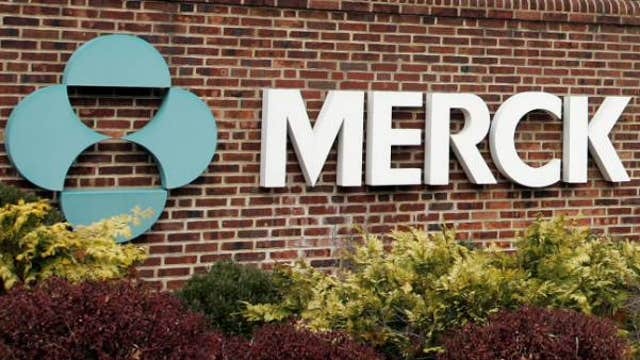 Merck & Co. raised its earnings guidance for the year on Tuesday, despite the negative impact of the stronger dollar, as its first-quarter results declined less than expected. Shares rose 4.2% in premarket trading. The pharmaceutical giant now expects per-share earnings of $3.35 to $3.48 a share, up from its previous range of $3.32 to $3.47 a share. Merck, like some of its rivals, said a strengthening U.S. dollar and increased generic competition sapped results in the most recent period. In response, the company has sought to develop drugs in rapidly developing fields. Pharmaceuticals, the company&apos;s biggest revenue contributor, posted a 2% decline in sales to $8.27 billion. The animal health division posted 2% growth, however, to $829 million. Sales of arthritis drug Remicade were down 17% to $501 million, and sales of cholesterol treatment Zetia/Vytorin slipped 9% to $887 million. However, sales of diabetes treatment Januvia edged up 4% to $1.39 billion. In all, Merck reported earnings of $953 million, or 33 cents a share, down from $1.71 billion, or 57 cents a share, a year earlier. The latest quarter saw a 5% negative impact from foreign exchange, and a 9% impact from the divestiture of its consumer care business, though this was partly offset by the acquisition of Cubist Pharmaceuticals Inc. Excluding certain items, per-share earnings fell to 85 cents from 88 cents. Sales fell to $9.43 billion from $10.26 billion the year before. Analysts had projected 75 cents a share in earnings and $9.07 billion in revenue, according to Thomson Reuters.